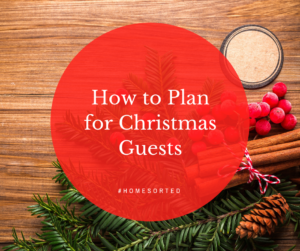 How to Plan for Christmas Guests - Home Sorted! Whether you’re ready or not, Christmas is fast approaching. This usually means one thing; Christmas guests. Our latest blog covers how to plan for Christmas guests to ensure you’re ready this holiday season. Keep reading for more. Don’t let surprises happen by scheduling times and dates into your diary as soon as they’re confirmed. We also recommend doing this for any Christmas parties or gatherings that you and your family members will be attending. First things first – you need to ensure that each guest has somewhere to sleep. If you only have a sofa bed to offer, ensure that you have clean sheets ready to put on the bed otherwise we recommend airing out your guest room, so it feels fresh and ready for visitors. Along with bedding, ensure you have supplies such as towels and basic food ready for your guest’s arrival. They will more than thank you for having extra milk and bread ready to go after a long drive or flight. Once your guests arrive, we always recommend telling them to make themselves at home – and mean it. This is a busy time of the year meaning that everyone needs to help out! You’re not here to wait on your guests. Let them know where things are in the kitchen and laundry and they’ll manage just fine. It’s always a good idea to have a few entertainment options ready to go! Especially if you have kids coming to stay. Ensure your Netflix subscription is up to date, dust off your family board games and find that cricket bat. No matter how busy the holidays get you should make time for some fun with your guests. If you have extra kids staying in your kids’ bedrooms, give yourself a head start on the clutter by packing up some of your kids’ toys before your guests arrive. This will ensure that cleaning is easier and that nothing gets misplaced in the commotion. Are you ready for Christmas guests? We sure hope so!